Spring is here. Now, bear with me I’m an optimist and as soon as March blows in, whether lion or lamb-like, I get a blossoming of energy, a bounce in my step and I start coveting bunches of daffodils and dandelion tea! I was a March baby so maybe it’s that vibrant buzz of birthday essence that sparks me to life, or maybe it’s just a natural response to the promise of returning foliage and warm air that conjures with my soul, I don’t know, but I do know that I really love spring and its first breezy hint of flowers. 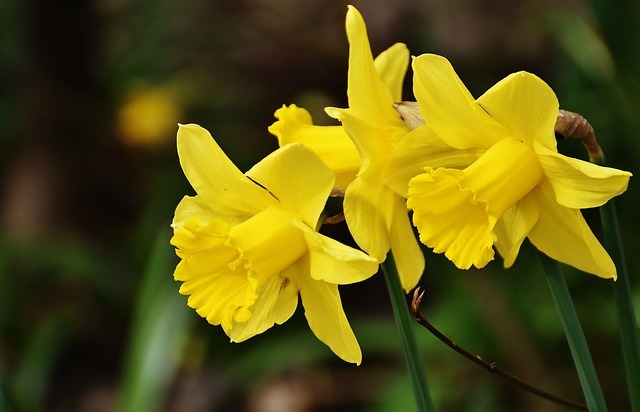 Daffodils are said to have dangerously toxic bulbs. Once, it’s claimed, they were used by Roman soldiers as a ‘go to’ suicide resource for times of desperation. Now, they are most people’s first choice of spring flower, and I confess they are my favourite cut bunch — never give one for fear of bad luck, only a bunch will do! I love the link to Narcissus inspired by their self-admiring faces, their symbolic connection to rebirth and their propensity to bring gold if you find the first daff of spring. But I’m drifting this year towards the edible but protected harebells (Campanula rotundifolia). 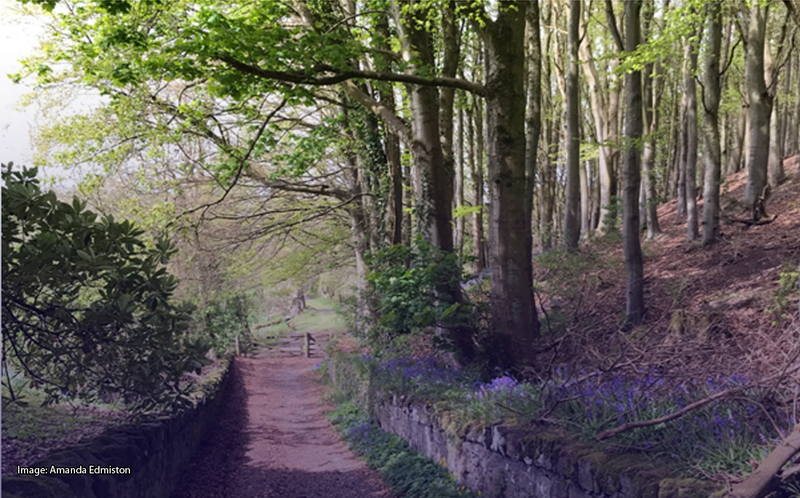 They’re the Scottish bluebell, old man’s bells, fairies thimbles, the Devil’s bells, cuckoo’s shoes, blavers, gowk’s thummies (a gowk is a cuckoo, they flower as the cuckoos arrive). They start flourishing a little later, from early summer through to autumn. And the mildly toxic, but bewitching British bluebell (Hyacinthoides non-scripta), wood bell, bell bottle, cuckoo’s boots, crow’s toes, wood hyacinth, lady’s nightcap, witches’ thimbles… that petal-soft shimmer of eye-capturing blue that carpets our native woodlands from late March through to May’s end. I want to share a snippet of a story or two, a leaf of lore and an element of history this spring and give you my thoughts on two of the nation’s favourite flowers. Native to the whole of the UK, both plants are at risk from the non-native prolific garden escapee the Spanish bluebell, maybe due to the old traditions that claimed it was courting bad luck to pull bluebells up, so they were often left to run riot in gardens! And, emblem that her daughters were modest, leal, and true. They pluck’d the Bell of Blue! Old Scotland’s Bell of Blue! Old Scotland’s Bell of Blue. I first remember playing the game at my third birthday party, weaving in and out of the circle of friends, my mum organising the children to run around, tapping each other on the shoulder. Here’s a link to a short film and the tune, if you fancy joining in the fun! 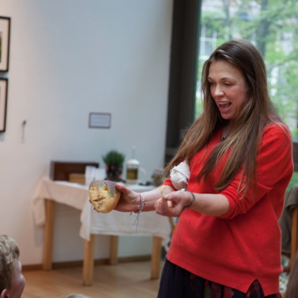 The origins of the rhyme aren’t clear, and inevitably some folk suggest it has connections to the ‘dance of death’ and plague boils. I suspect a great muddling with ring o’roses, and every second nursery rhyme in the British pantheon is probably at play here. The other explanation is that it links to the feeing fairs when farmers went to hire workers, which sounds much more credible. The usual date for the first of two feeing fayres held in locations across Scotland was towards the end of the bluebell season, the start of the harebell one, often at the end of May around Whitsun. The second one usually held in the autumn as the harebells retreat, often coinciding with Martinmas. Maybe that’s why the bluebells were dusty: going to seed as spring merged into summer, and summer to autumn! So, what of the stories behind those intriguing names? Well, I told a tale where harebells were used by witches to turn themselves into hares to hide from pursuers chasing them, through the woods of Dollar Glen, to one group of older folk I was working with on The Kist in Thyme project in rural Perthshire. A lovely lady in her 90s added that her mother had always warned her that they were called the ‘auld man’s bells’ and to hear them ring meant that the Devil was approaching, and the jingling may signal your oncoming demise! I suspect a thread of connection to the witch trials, plants once revered becoming associated with ‘ungodly creatures’ — witches and their familiars — is at play here; a story formed from fear, maybe created during the 16th century told in order to keep folk safe from accidentally revealing themselves as a witch, or maybe a story spread by accusers clutching at flimsy stems in order to prove witchery was at work! In Somerset they say you should never venture into a wood to pick bluebells. If you were a child you may never come out again, and if you are a grown-up you will be pixy-led until someone meets you and takes you out. The more benign harebell faerie in Cicely Mary Barker’s Flower Fairies of Summer (1925) tells the tale of the fairies’ bells that has now slipped into our most fondly held piece of buebell-lore: that they signal the fairies gathering. I was told as a child that if you heard them ring it meant a fairy was near, though no mention of death or the devil! 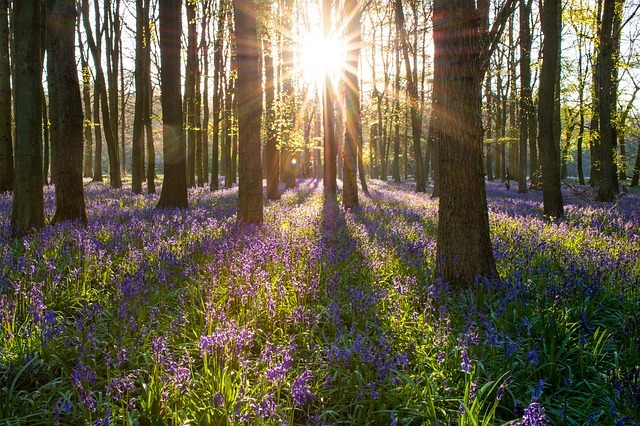 Whichever strand of bluebells’ connection to magic you lean towards, the theme is undoubtable — they are a flower which can draw us into a liminal place, that mysterious and beguiling shade of blue, that is one of the most appealing shades to so many people. Symbolic of peace and tranquillity a shade of both sea and sky, coveted by artists, redolent with wealth, offering enchantment as it starts to shimmer across a woodland floor. We can all breathe in, listen carefully and mind ourselves, just in case we hear a tinkle and a chime as we wend our way home and breathe out as we reach the path, safe in the knowledge that spring is here, we’ve escaped from the de’il and that hint of blue carpeting our dreams may just signal the chance of true love.